The provisioning of the families of the officers and men to the number of 22,000, of whom 9,000 are combatants and 13,000 non- combatants, who have been called under arms in accordance with the mobilisation order of June, including the levy of 1903 for the subjugation of the Armenians, has been imposed on the inhabitants of Erzerum, and up to the present date provisions, animals and transport material to the value of one million-and-a-half pounds have been requisitioned. Appreciating the great aim in view, the popula tion have willingly consented to make all these sacrifices. A very bad impression, however, has been produced and has moved the population to revolt and resist, from the fact that the notorious letter written by Tchitcherin has to a certain extent contributed to the failure of the military operations; that the Army, under the pretence of an Armenian-Bolshevist alliance, has shown a certain lack of courage, whilst the Armenians, having been emboldened by this letter of Tchitcherin s, have tyrannised over the Mohamedan population, and that no success has been reached in coming to a satisfactory understanding with the Reds, and, finally, that the abuses disclosed by Djelaleddin Arif Bey have been permitted. 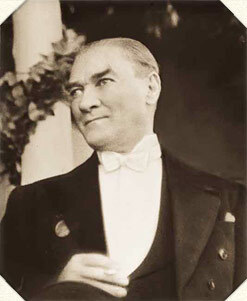 Kiasim Bey having failed to possess the necessary qualifications to conduct the affairs in the East, a strong party must be created here capable of standing up against the Armenians and carrying on the political and military affairs in a proper way and furnished at the same time with extraordinary powers. A great deal of precious time has already been wasted the documents are at Angora and probably many favourable oppor tunities have been lost. On the other hand, taking the season into consideration, a diffi cult time has arrived for Erzerum. Care must be taken to protect the Army against the bad weather, for great difficulties must be over come to supply the men with clothing and provisions. Civil and military authorities have not been paid for the last four months and it is considered that requisitions must be made to cover the military expenditure; but it is not known whether the population will be capable of making this new effort, which seems to be out of all possibility. The central Government is indifferent, and the neighbouring pro vinces especially the Province of Karput do not take the slightest interest in the matter. Demand explanations from the Government about this state of affairs, or, if necessary, from the Assembly, in my name. After you have finally secured the supply of necessaries for the Army, come here. Midhat, Director of Public Instruction. As can be seen, the person who, as Arif Bey believed, should have deemed his claims worthy of being brought before the Council of Mini sters and whose cipher key as Minister he had permitted himself to use, did not desire to be his confidant but informed the President of the Assembly. We quite understood how the game was intended to be played through a telegram that was sent in the name of the entire population of Erzerum, signed by forty or fifty persons, when another telegram arrived which also came from the population of Erzerum and which clearly showed how loyal this population was to the Government and the Grand National Assembly and how willing they were to submit to sacrifices. Djelaleddin Arif Bey, having at last seen with his own eyes that the armies of the Grand National Assembly were victorious in the Armenian expedition forty-seven days after he had been ordered to return, was eventually convinced that he would have to leave Erzerum. Erzerum, 27 th November, 1920. To the President of the Grand National Assembly. We beg to inform you that our honourable deputy Djelaleddin Arif Bey, Vice-president of the Grand National Assembly and Minister of Justice, accompanied by our deputy Hussein Avni Bey, left for Angora yesterday. In spite of the severity of the wintry weather, he has been greeted by the inhabitants of Erzerum with great and brilliant manifestations. We take this opportunity to express to the Assembly our esteem. President of the Central Administration of the Committee for the Defence of the Rights. When they returned from Erzerum, Hussein Avni Bey and Djela leddin Arif Bey took up a very hostile attitude against Kiasim Kara Bekir Pasha and worried the Assembly by attacking him. The position on our Eastern frontiers which engaged our urgent attention did not allow us any more time to trouble about the traces which Djelaleddin Arif Bey had left in the history of the revolution at Erzerum. I will now turn to the serious affairs which took place simultaneously on our Eastern borders. On the 9 th June we ordered the temporary mobilisation in the Eastern districts.